Another huge thanks to Rachel @ Rachel’s Reading Corner for this recap! Samantha Kemi is an alchemist from a very traditional family, but her family’s work has been taken over by factories that synthesise ingredients for potions. One day the princess of her country, Evelyn, accidently takes a love potion that makes her fall in love with herself. A Wilde Hunt – a competition between alchemists to find a cure potion – takes place and Samantha joins the competition with her friends Anita, Anita’s brother Arjun, and her family’s Finder Kirsty. They have to travel across different countries and have many near-death experiences tracking down the ingredients for the love potion. The whole time she is in competition with ZA – the company which synthesised potions and tries to sabotage her – and Emilia Thoth, the King’s exiled sister who performs illegal black magic. Zain – the son of ZA’s CEO – falls in love with Sam throughout the Hunt despite the two family’s rivalry, it’s a bit Romeo & Juliet really. In the end, ZA gives Evelyn a synth potion that nearly kills her but Sam saves the day with a natural potion. Princess Evelyn’s 18th birthday party is cancelled when she accidently takes a love potion made for her best friend Zain. It makes her fall in love with herself instead, but she is convinced it is a girl named Lyn. Samantha (Sam) Kemi was on the way to the birthday party with her best friend Anita when she is summoned to see the king. A Wilde Hunt is called to cure Evelyn of the love potion. Sam’s Grandad – who is very anti-synth, ZA and Royals – doesn’t let Sam enter the Wilde Hunt. Emilia Thoth – the king’s exiled sister who performed illegal black magic – is called by the Horn and the King is outraged, calling the police to track her down and abolish her from the competition. Sam’s family Finder, Kirsty, comes to see Sam and convinces her to join the Hunt. They are given the name of the first ingredient – merpearl – and set out immediately to get some. It can only be harvested during a rare Rising (mermaid dance ritual thing during a full moon), which is that night, and they are already hours behind the other teams. They manage to team up with Anita and her brother Arjun, and get a boat to take them to the mermaid’s lagoon. At the lagoon the mermaids only respond to male’s voices, so Arjun has to sing. Unfortunately ZA is there and they’ve hired a professional singer to entice the mermaids. Luckily a mermaid attention is caught and as it swims over to Sam’s group. ZA bring their boat between the mermaid and Sam’s group however, and Arjun has to sing again. He attracts an old mermaid who tries to drown him. They managed to get her pearl but Arjun is bitten. They only get the one pearl though so Anita/Arjun’s team has one but Sam/Kirsty don’t. They think they have to drop out of the Hunt. Zain – the ZA’s CEO’s son – visits the Kemi shop to see Sam. He apologises about his father’s sabotage at the Rising and ends up staying to help Sam stocktake the shop. Sam realises that a bottle of merpearl is missing. She asks Zain to take on her a tour of his dad’s factory. Princess Evelyn perspective: She remembers how she once ask her best friend Zain if he would marry her, and he said no. This was what led her to make the love potion. She continues to plan her and Lyn’s wedding. Zain and Sam catch the tram to Zol’s factory. They go down the R&D level to have a look. Sam storms out of the factory when Zain tries to convince her she could easily apply to be an intern there – she would never work with synths. At home, Sam prepares a truth potion, and slips it into her Grandfather’s drink. During dinner Sam asks her grandfather about the merpearl and he says it’s hidden in the lab – he didn’t want her joining the Hunt and hid it. Her family gives her blessing to re-join the Wilde Hunt. Kirsty and Sam head to the airport to get a plane to Bharat (another country). They need to find Eluvian Ivy, which might be an ingredient in the love potion. They met up with Anita and Arjun in Bharat. Their cousin, Vijay, is their guide. Anita heard rumours that golden jasmine may also be an ingredient but Vijay says that the incredibly rare pink jasmine is even more potent and his village allows the group to take two blossoms from their sacred pink jasmine tree. They arrive at the village and Sam thinks that abominable hair might be another ingredient. A fire starts in the jungle. The group flees. Emilia appears, and reveals she tracked Anita and Arjun. She set fire to the pink jasmine tree. Kirsty convinces Sam that Anita and Arjun are slowing them down and they leave them behind. Princess Evelyn in the meantime gets even crazier. Kristy drives them to a hotel, and Sam calls her father. Her father says two Participants had to drop out because their merpearls were stolen. A journalist who was attacked by Emilia too talks to Kirsty as Sam heads to bed. Kirsty befriends the journalist – Daniel – and he accompanies them as they head out to the jungle to find eluvian ivy. In the jungle Sam is attacked by Luvy – a vine that attaches itself to your emotions and drags you up into the canopy of the jungle trees. Sam manages to trick it though, and steals one of its flowers – a rare ingredient in mixing. Kirsty also managed to snag a couple of vines Luvy, which Sam thinks might be part of the love potion. Kirsty sells the Luvy flower to pay for the rest of the journey. They wind up in a fancy hotel, and pay for Sam’s dad to join them in Bharat so he can bring the equipment they need to start making the potion. They make the luvy and merpearl into a paste, and then Kirsty and Sam leave John in the hotel to start hunting for the abominable hair. Kirsty, Sam and Daniel bus it up to the mountains. Once they get up there they find Zol arguing with a friend of Kirsty’s, Jedda who is their mountain guide. Kirsty makes a deal with Zol that they will travel together up the mountain to see the Sherpa, as it is safer, but then split ways. Zol won’t let Daniel come though. When they arrive at the Sherpa cabin and find it empty and with no cell service. Jedda wants to leave, but the rest of the group decide to hunt down some abominable hair, together, regardless. Zol uses his magic to look up a satellite image of the mountain on his phone but the phone and his object – a ring – blow up into magical soot. He didn’t listen to Kirsty when she said that magic doesn’t work at this altitude! Zain manages to find abominable tracks and they head out. They run into Emilia who threatens them. She has the missing Sherpa held at gun point. She is about to shoot Sam but the ground below rumbles and Sam is thrown down the slope. Kirsty attacks Emilia but is quickly overwhelmed. Emilia grabs the Sherpa and drags her away. Zain reaches Sam but then an avalanche hits and they are swept away. Zain and Sam cannot find anyone else so they set up camp at the entrance of a cave. They huddle in a tent and get talking. Zain tells Sam the ‘real’ story about the origins of ZA and why her Granded hates them so much – turns about Cleo synthed a centaur’s eye for the Wilde Hunt potion and was so ashamed she didn’t want to submit it. ZA did anyway and won. Zain also reveals he wears a glamour – his hair is actually brown, his teeth are a little crooked and he doesn’t have tattoos. Sam kisses him – it’s adorable! In the morning an abominable attacks and Zain tries to magic it away. They run into the cave, and are chased into a narrow passage with a dead end. The abominable sit outside the passage, waiting for them to come out as it is too narrow for it to fit in. Sam manages to make a drowsy potion with Zain’s burning wand and some mountain flower petals. They abominable gets sleepy and they sneak out past it, Sam grabbing some hair on the way. Outside Kirsty has a helicopter and they jump in, flying off. Kirsty becomes furious when she hears that Sam split the hair with Zain. Dan tells her that all the other Participants – excluding ZA, herself and Emilia are out. Emilia sent a bomb to the Patels and nearly killed Anita and Arjun’s dad. Zain sneaks over that evening to thank Sam for saving his life… and tell her he really does like her for who she really is, and not the mystical version of her family that his grandfather told him about like Sam worried. Princess Evelyn perspective: Zain goes to visit the Princess – he and his father Transported the night before – and ask her what she put in the potion. She gets hysterical that he’s “taken away her Lyn”. Her magic gets out of control – nearly killing the Queen – and she has to be sedated, whispering “love” as she’s knocked out. Kirsty and Sam fly home. At home Sam realises the next potion ingredient is a unicorn tail – something very, very, very hard to find as unicorns can only be approached by someone that has never fallen in love. This means that Kirsty cannot go on the Finding and Sam’s thing with Zain means she isn’t sure she can either. Kirsty and John think Zain MADE Sam feel like this to sabotage her from finding the unicorn tail. Molly volunteers to go, but her parents shut that idea down quickly. Sam then goes to apologise to Anita and they make up. Anita shows her the latest cast – Zain making a statement to the press saying that the Princess’ love potion was meant for him and he doesn’t know why since “he’s always loved her”. Sam is devastated. To cheer her up, Anita shows her a pink jasmine tree she is growing in her greenhouse – she managed to salvage a root of the Bharat tree and regrew it at home. Sam gets a call from her Mum saying that Kirsty took Molly to Zambi to find the unicorn tail – without their permission. Arjun and Sam head out to meet up with them. In Zambi, Sam finds Kirsty with Molly suspended in a cage – bait for the unicorn which comes into the close, acting rather violently. Molly somehow falls out of the cage while Sam tries to rescue her, onto the unicorn’s back which takes off with her. Molly uses her magic to put the unicorn to sleep. Emilia appears and threatens them with a gun, she wants the unicorn’s tail. She admits to her sabotage in the Hunt – which is caught on live media as Sam had contacted Dan before heading into the jungle and he bought Zambi reinforcements (helicopters and a SWAT-like team). Emilia flees. Sam is cleared to transport home, but Kirsty – who was gouged in the attack – and Arjun – who’s got travel sickness from his first Transport – aren’t allowed to go home until they are medically cleared. Kirsty makes Sam get a sliver of the unicorn’s horn out of her shoulder wound before leaving – it has the same properties as the tail and it is illegal to harvest any unicorn parts so she has to sneak it. At home she recounts the tale to her parents and then contacts the Royals through the Summons – telling them about Emilia. They, instead, inform her that the Hunt is over. ZA produced a synth version of the potion and the Royals don’t care about putting it in the Horn (to test whether it is right) as long as the Princess is cured ASAP. Sam is devastated. Sam realises ZA’s potion is wrong because the colour is off. 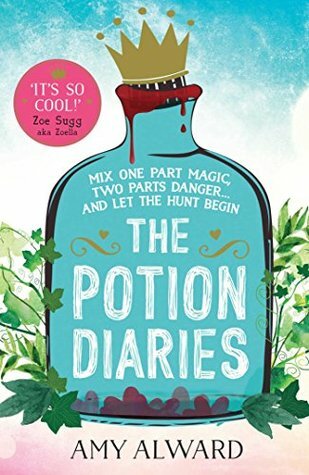 Sam spends all night properly mixing the ingredients into a potion – and she discovers the final ingredient thing the potion purple (the right colour): cutting her palm and letting the blood drip into the potion. Sam tries to transport to the palace but no one lets her in. Finally Evelyn’s grandmother lets her through though – she owes Sam’s grandad her life. Sam gets there just as they have given Evelyn the synth potion. It doesn’t work and unfiltered magic begins to flow from Evelyn. Sam manages to give force some of her potion into Evelyn’s mouth and Evelyn awakens completely okay. Sam reveals that the act of cutting her palm was the final ingredient of the love potion: unrequited love. Evelyn talks to and thanks Sam for saving her. A Royal dinner is going to be thrown for her to celebrate saving the Princess’s life. Zain comes to talk to Sam and says that he thought that Evelyn tried to tell that the last ingredient of the potion was love, so he tried to fool himself into thinking he loved Evelyn – by making a huge and public declaration of love – so the potion would work – which it obvious didn’t. Sam forgives him, and it ends with them kissing – aww! Grimoires = potion diaries; diaries kept by alchemists with notes on potion making, ideas for new potions etc. Merpearl = mermaids’ pearls; have to be harvested at certain times. Summons = a magically charmed piece of glass that allows an individual to travel instantly between two of them. Kind of like the Floo Network (if you know Harry Potter), but with mirrors and glass panels instead of fireplaces.